Brooklyn is a New York borough, made up of many different neighbourhoods, and there is no better way to explore them than by foot, with the help of Google maps! 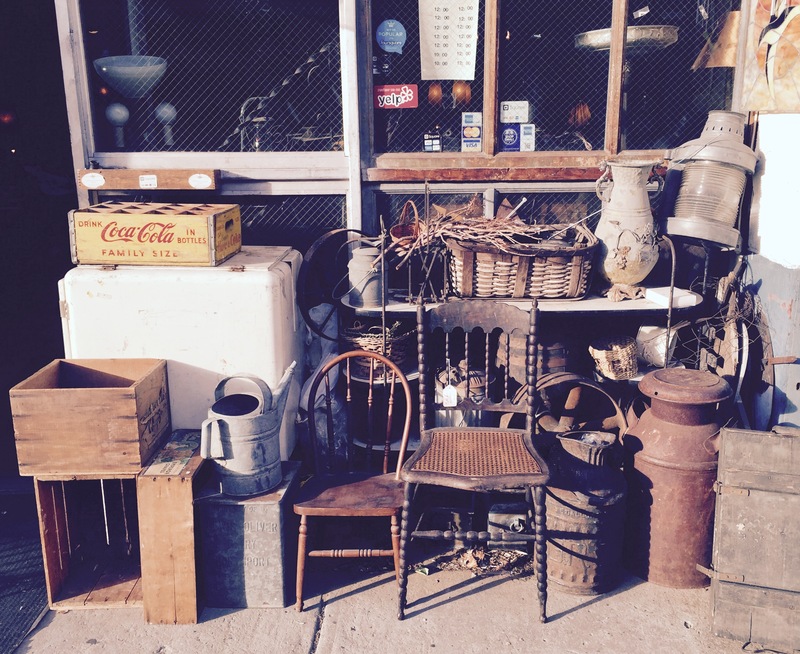 On our first afternoon in NYC we took a walk around Bedford Avenue, with its cool dive bars and vintage shops. After walking for what felt like miles, we ended up strolling through Williamsburg. We knew something must be going on as the streets were packed with Hasidic Jewish families, important-looking Rabbis and street stalls selling palm branches. Later we were told that it was Yom Kippur, the Day of Atonement. It was really interesting to stumble upon. 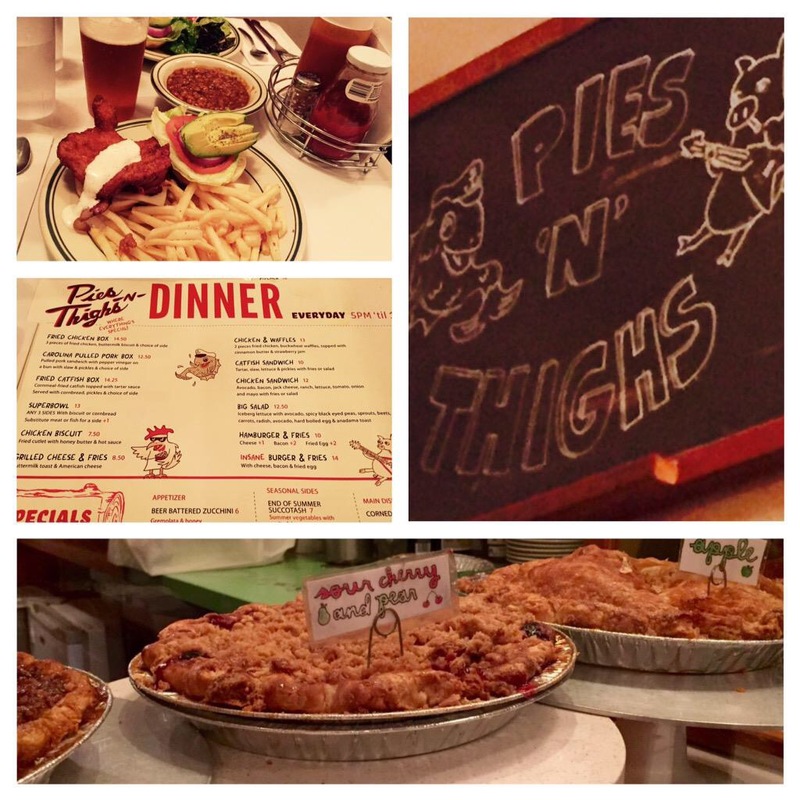 We had heard about a fried chicken restaurant just under the Williamsburg Bridge, Pies ‘n’ Thighs, so we headed there for dinner. Pies’n’Thighs started back in 2006 as a group of chefs frying chicken and making award-winning pies in the tiny confines of a beer storage room, using free-range meat from local farms. They’ve since expanded and opened up a Lower East Side restaurant too. We both ordered the Fried Chicken Sandwich: chicken cutlet, bacon, Jack cheese, ranch sauce, sliced avocado, lettuce, tomato, onion and mayo on a toasted bun. The chicken was crispy and spicy and the seasoned avocado gave the burger an illusion of health. I ordered a side salad with a lime and coriander dressing – delicious – and Phil went for the barbecue beans which had a great smoky flavour. I was tempted to try the chicken, biscuits and gravy, but on seeing the size of the portion the person next to me was struggling with, I decided to give it a miss. Pies’n’Thighs was a taste of the south and a good sign of what was to come when we hit South Carolina.